Comments Off on Bruins Score Four Unanswered in the Third to Take Over First Place! Bruins Score Four Unanswered in the Third to Take Over First Place! 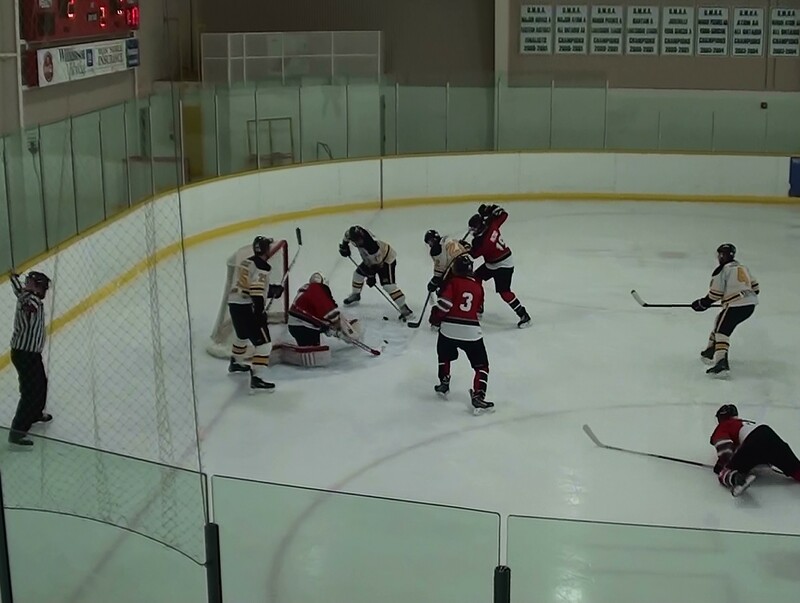 Trailing 2-0 going into the third period the Bruins rallied for a 4-2 Victory over the Lakefield Chiefs. 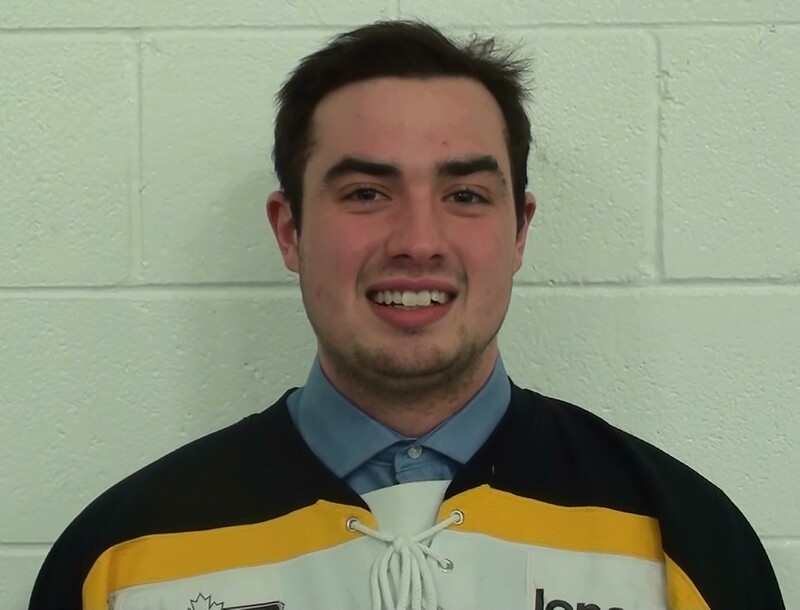 Ryan Miehm recently obtained from the North Kawartha Knights, scored his first goal as a Bruin when he redirected Conner Evans point blast past the Chiefs tender. Adam Bartholomew laid out one of the heaviest hits of the season sending his opponent to the ice as his glove and stick went flying in the air. Then it was Marco Mastrangelo picking up the puck behind his own net as he flew down the right side finding Tyson Eastgate whose shot was stopped but Mastrangelo buried the rebound to tie the game. With momentum in their favor, just 26 seconds later they took the lead as Todd Winder rammed home a rebound from a Conner Evans point shot and it was 3-2 Uxbridge. Then it was a hilite reel goal by Evans as he went coast to coast firing a wrister over the glove of the Lakefield goalie, sending the Bruins Fans into a frenzy! He finished the night with 3 points helping his teammates as they moved into 1st place with the win and they play on Sunday in Keswick (3:20pm) against the Georgina Ice who will looking to play a spoiler role! Bruins are in Clarington on Wed. Feb.4th at 7:20pm. 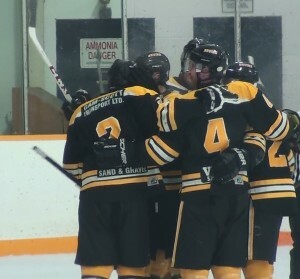 Comments Off on Bruins Win Nail-Biter in Lakefield! Bruins Win Nail-Biter in Lakefield! Adam Bartholomew snuck in the back door on the power play late in the game scoring the game winner in a 2-1 win over Lakefield, Shane Smith and Daryl Thomson added assists as Thomson controlled the puck on the power play and his shot was tipped by Shane Smith, but the rebound went directly to Bartholomew who one timed it into the net. Marco Mastrangelo found Jarret Smith (PP) on the same type of play in the first to get Uxbridge off to a 1-0 lead, but the Chiefs replied on their power play 1:04 later to tie it after one. Tyson Eastgate also assisted. There was no scoring in the 2nd period as Brandon Francey made some big saves when needed. The Bruins are now tied for 1st place with Lakefield and have 1 game in hand. The rematch is this Friday Jan.30th at the Bear Den. Hope to see you there Bruins Fans! Comments Off on Exciting Match Against Merchants Goes to a Shootout! Exciting Match Against Merchants Goes to a Shootout! 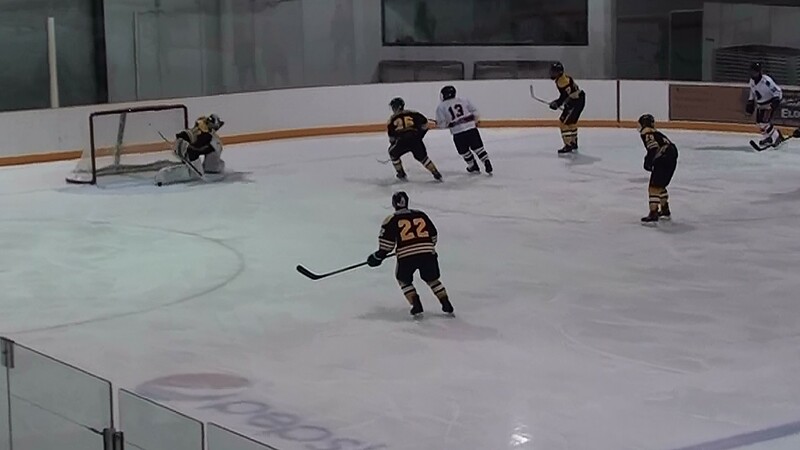 On Canadian Tire night at the Bear Den in front of a larger and boisterous crowd, the Uxbridge Bruins defeated the Little Britain Merchants on a shootout goal by Todd Winder 3-2. It had looked like Uxbridge had the winner on Jarret Smiths power play goal from Marco Mastrangelo and Tyson Eastgate but the Merchants tied it up forcing overtime and then the shootout. Smith roofed a shot after some pretty passing by Eastgate and Mastrangelo as he caught the Merchants goalie sliding away giving Smith nothing but net. In the first period Patrick Bolahood took a pass from Dylan Lock and lobbed a shot at the net, which went through a maze of players and the Merchants goalie’s legs for an early 1-0 lead. Little Britain tied it in the second at one a piece. Brandon Francey stopped all three shots in the Shootout for the win. Uxbridge plays the Lakefield Chiefs in the battle for first place in a home and home set on Tuesday Jan.27th at Lakefield and Friday Jan.30th at the Bear Den! 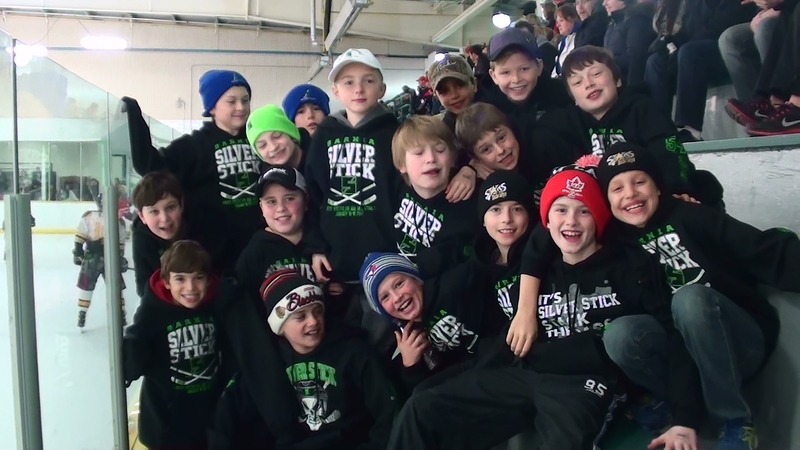 The Uxbridge Bruins honoured the Minor Peewee A and Major Atom A teams during the second intermission for their recent Silver Stick Championships. Congratulations from the Uxbridge Junior C Bruins! 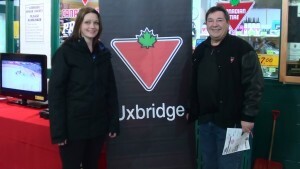 Comments Off on Uxbridge Cruises To Victory In Port Perry! 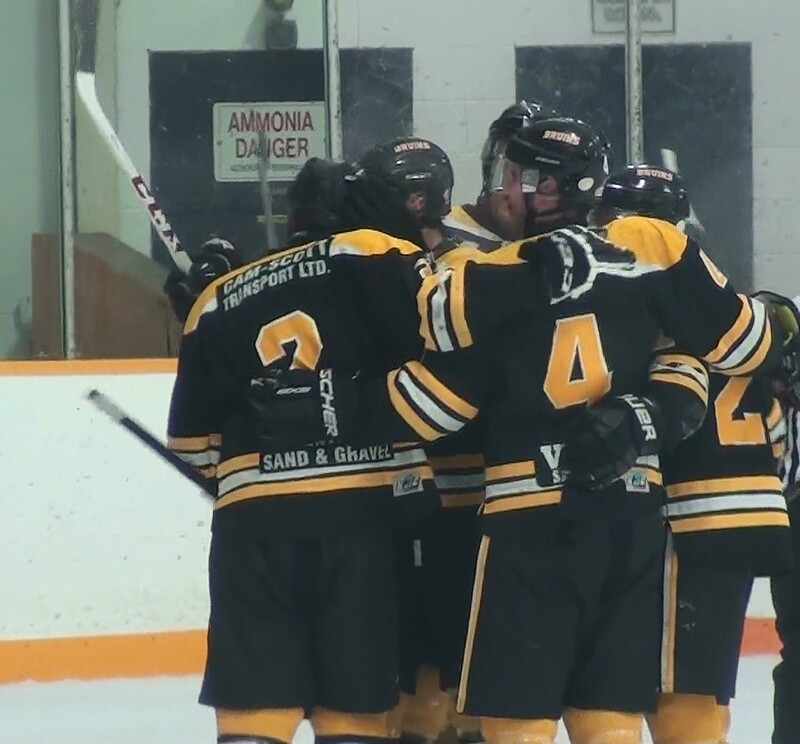 Uxbridge Cruises To Victory In Port Perry! The Bruins lit up the goal light 4 times in a 2 minute, 38 second span enroute to a 7-3 win in Port Perry Sunday afternoon. Aiden Reilly got the visiting team on the board just 1:20 into the game but the Mojacks tied it before the period ended with 1:19 left to go. Then the Bruins exploded for 6 straight goals with Jason Simmonds giving the Bruins a 2-1 lead before the 4 goals in a 2:38 span. They were scored by Tyson Eastgate (SH), Marco Mastrangelo (SH), Korey Brand (SH) and Todd Winder (SH). All four goals while playing a man short! Patrick Bolahood closed out the Bruins scoring as they held a 7-1 lead before the Mojacks got one back to end the second period. Seven different goal scorers for the Bruins and Carter Vahey and Michael Spataro both had 2 assists on the day. Port added a short handed goal of their own with 33 seconds left for a 7-3 Bruins win. There were 80 minutes in penalties to Port Perry and 52 Minutes to Uxbridge. 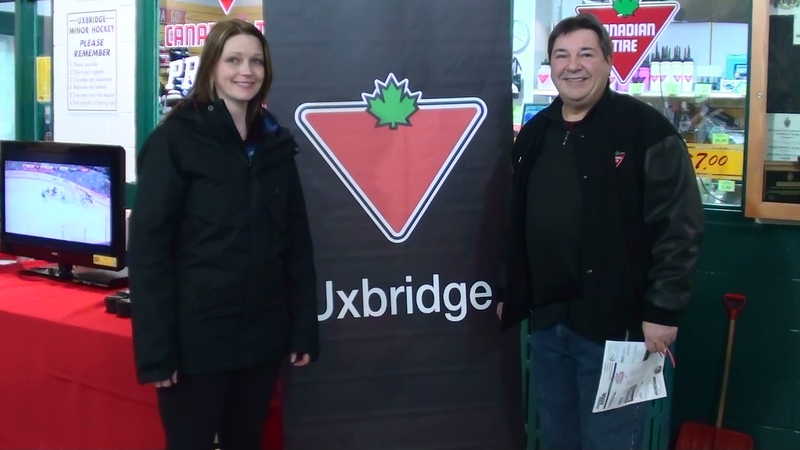 Uxbridge host the Little Britain Merchants on Fri. Jan. 23rd at the Bear Den. Comments Off on Bruins Flying High Over The Eagles in 5-2 Win! Bruins Flying High Over The Eagles in 5-2 Win! The Uxbridge Bruins came out flying in the first, scoring 2 goals for the lead after 20 mins, as Korey Brand fired a wrister off the crossbar and then it hit the center bar on the Eagles goalie stick side. Robert Freckleton made it 2-0 as he outworked the Clarington player behind the net and came out front firing a backhanded shot for the goal. Both were unassisted. In the second period Uxbridge took 5 straight penalties and the Eagles added one power play goal and an even strength goal shortly after a penalty had expired, but the Bruins added two of their own on the Power Play to lead 4-2 after two. Marco Mastrangelo banged home a rebound off of a Carter Vahey point shot, with Michael Spataro also assisting. 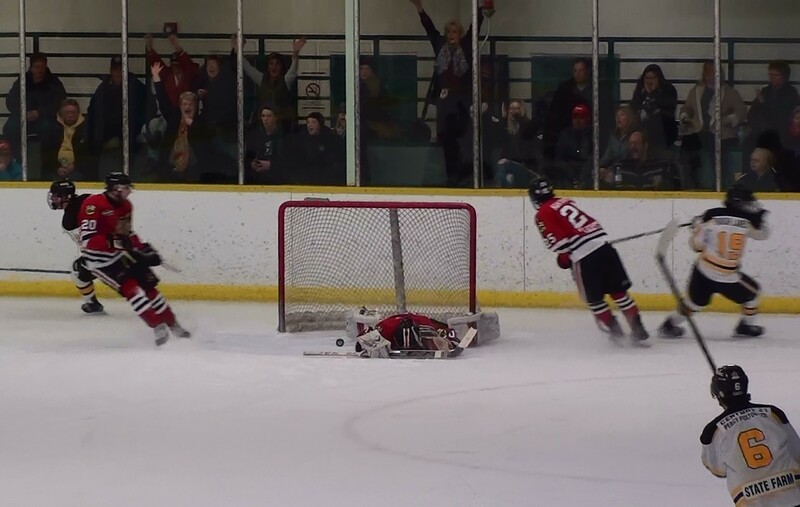 Then it was Conner Evans firing a point shot that got through to beat Clarington’s goalie with Spataro getting his second assist on the night. In the third Mastrangelo again scored on a redirect of Jarret Smith’s pass to seal the win. Brandon Francey was solid in goal for Uxbridge stopping 24 shots. The Bruins are in Port Perry on Sun. Jan. 18th for a 2:25 pm game with the Mojacks, then they host Little Britain on Fri. Jan. 23rd at the Bear Den. Comments Off on Welcome Back Michael! 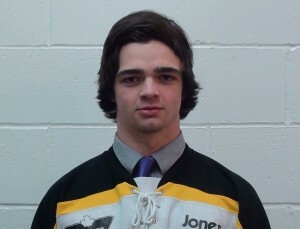 The Uxbridge Bruins management and executive would like to welcome back Michael Spataro to the hockey club. Michael Graduated to the Lindsey Muskies of the OJHL two years ago, playing for former Bruins coach Dan West. The Bruins General Manager Ron Archibald, made a transaction to get Spataro back to the Bruins at the trade deadline. Michael wasted no time contributing to the team as he scored a goal in his first game back last Saturday in Little Britain against the Merchants. He gives the Bruins added depth on defense as the team battles with 3 other teams for 1st place in the Central Division heading into what will be a very entertaining playoff battle. Comments Off on Bruins Move Into Second Place With Win In Little Britain! Bruins Move Into Second Place With Win In Little Britain! Comments Off on Bruins pick up win and add Ryan Miehm to their Roster! Bruins pick up win and add Ryan Miehm to their Roster! The Bruins welcome Ryan Miehm to the hockey club as he was obtained near the trade deadline from the North Kawartha Knights. Ryan is a left handed shot at 6′ 0″ playing forward from Courtice On. and will be wearing jersey number 19. It’s great to have you on board Ryan. In tonights game, Tyson Eastgate scored two goals including the game winner as he picked up a pass from Marco Mastrangelo in the slot and fired a bullet past the Knights goalie. Robert Frekleton, Patrick Bolahood, Conner Evans, Adam Bartholowmew, Alex Williamson and Carter Vahey also scored for the Bruins. Jake Jooston started in net allowing one goal but had to leave just over 10 minutes into the first as he was battling a flu bug, Brandon Francey came in to mop up for the win. Coach Geoff Hodgkinson took a puck deflection on his head that required medical attention at the local hospital and was back near the end of the third period. Comments Off on Golden Team Canada! 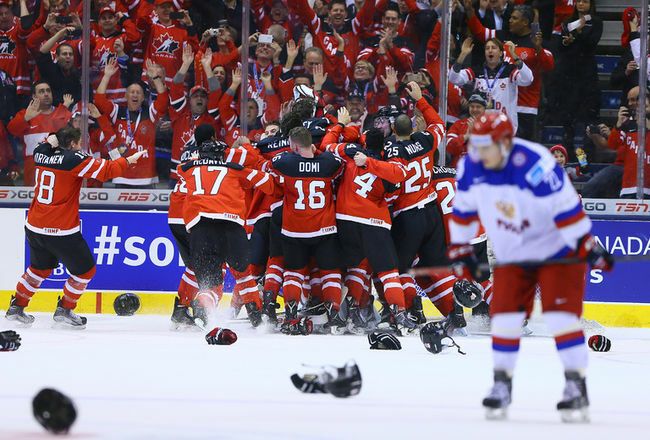 (Photo Courtesy Calgary Sun) Congrats to Team Canada on their 2015 Gold Medal Win from the Uxbridge Bruins! 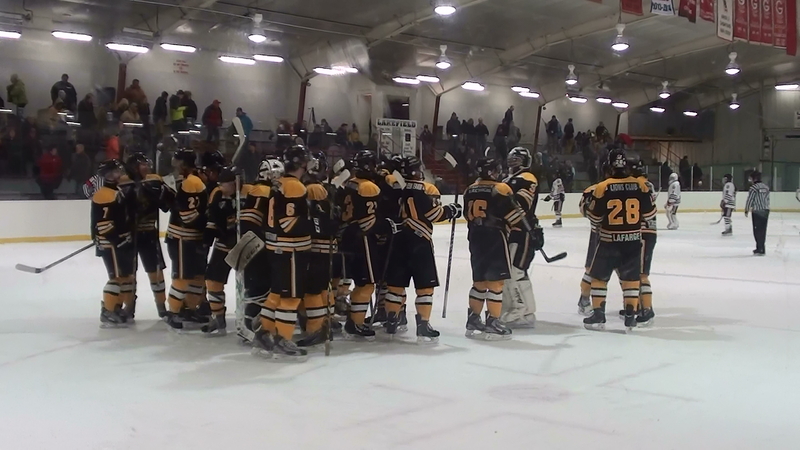 Comments Off on Bruins take Win in Snowy North Kawartha! Bruins take Win in Snowy North Kawartha! After a snowy drive arriving late, the Bruins left with a 3-1 win over the Knights, tonight. Shane Smith faked a shot pulling the goalie to one side and walked around him firing into the open net for the winning goal. Also scoring for the Bruins were Robert Freckleton and adding an insurance goal, Korey Brand. Jake Jooston took the win in goal.